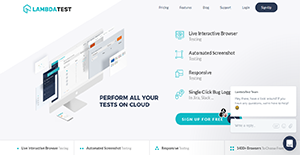 LambdaTest is a web-based, scalable testing platform that assists developers and teams in bringing their software assessment needs to the cloud infrastructure. With this system, release processes are hastened, and products arrive at the market at a faster rate. With LambdaTest, developers can seamlessly test their websites or web applications across more than 1,400 browsers and their assorted versions on multiple operating systems in varying screen resolutions. These setting allow them to make sure that their projects deploy flawlessly in any environment. Moreover, LambdaTest revolutionizes the testing experience by automating the process in all aspects. This way, developers can swiftly pinpoint errors, troubleshoot, test once more, and push to the web. With LambdaTest, developers have all the tools necessary to accelerate their development process. With these means, they can take push their websites and web applications to the cloud and toward their target audience at a faster rate. LambdaTest provides developers with the tools they need to ensure that their websites and web applications are in perfect working condition. These include Firebug, a debugging application, which assists developers in identifying bugs in their codes and in swiftly resolving such issues. LambdaTest assists developers in taking note of technical issues such as bugs as they go. That is because all remote browsers are pre-installed with RIA software such as Flash, Silverlight, Shockwave, Quicktime, and more. LambdaTest integrates with debugging and communication tools. The debugging synchronization enables developers to work faster in making their websites and web applications run smoothly while the connection with communication apps enable teams to collaborate flawlessly. Be it for an individual, a small team, or a quickly growing group, LambdaTest works for everyone. The application scales as needed and can support freelancers and entire teams of developers. The LambdaTest support team is at hand 24/7 to aid users. They can be reached through email, live chat, and phone call. Users can file support tickets as well that the support team do their best to resolve instantly. What Problems Will LambdaTest Solve? Live Interactive Cross Browser Compatibility testing: Testing a webapp or website for cross browser compatibility is always a big effort. For thorough browser compatibility testing, a tester has to test the app across multiple browsers and browser versions, operating systems, and resolutions. Which in total comes out to be more than 1400 combinations and that also if we take only most popular environment combinations. With LambdaTest in a single click the users get virtual access to a pristine testing environment having desired browser, browser version, operating system and resolutions. Users can perform Live Interactive testing of their website or webapps directly from their browser as if they are performing it on their own system. The environments are running real browsers on real operating systems. Automatic Screenshot Testing: Making sure that the layout of their website or webapp is pixel perfect, a tester has to test their pages on 1000+ browser combinations, which is a monumental task. However, with LambdaTest it takes a single click for users to take screenshots of their website/webapp across multiple browser combinations. This drastically reduces cross-browser and cross-platform regression layout testing. Responsive Testing: This is a handy feature that allow users to test how their website or webapp will render across multiple device screen sizes. The salient feature is, that the users get a realistic device appearance based on user’s viewport size. The users can check how exactly their customers will experience their page on a specific device. If you are considering LambdaTest it could also be sensible to investigate other subcategories of Best Test Management Software collected in our database of SaaS software reviews. There are popular and widely used solutions in each software category. But are they automatically the best fit for your organization’s specific wants? A popular software product may have thousands of subscribers, but does it present what you need? For this reason, do not blindly shell out for popular systems. Read at least a few LambdaTest reviews and mull over the factors that you desire in the software such as the cost, main features, available integrations etc. Then, select a few systems that fit your requirements. Check out the free trials of these products, read online opinions, get explanations from the maker, and do your research systematically. This exhaustive research is sure to aid you choose the best software solution for your organization’s special needs. Day Pass: $15 for 10 Days. Your Card won’t be charged after 14 days. Easy one-click integration with some of the widely used business and project management platforms like Visual Studio Team Services, Slack, BitBucket, Gitlab, Github, Trello, Asana, and Jira. We realize that when you make a decision to buy Test Management Software it’s important not only to see how experts evaluate it in their reviews, but also to find out if the real people and companies that buy it are actually satisfied with the product. That’s why we’ve created our behavior-based Customer Satisfaction Algorithm™ that gathers customer reviews, comments and LambdaTest reviews across a wide range of social media sites. The data is then presented in an easy to digest form showing how many people had positive and negative experience with LambdaTest. With that information at hand you should be equipped to make an informed buying decision that you won’t regret. Helps you with both automation and manual testing. Helpful Platform for Cross Compatibility Testing!! Awesome and Easy to Setup Product. What are LambdaTest pricing details? What integrations are available for LambdaTest? For more information about integrations, contact support by phone, email, or web form. Pros: We were looking for a tool that can help us with both automation and manual testing and that's how we came to know about lambdatest on producthunt. We tried their freemium plan and we were amazed with the performance of lambdatest. It worked seamlessly. We are able to see the detailed logs and analytics of the tests performed which help our quality assurance team to give a green go for the deployment of the product. Cons: We don't find such worrying issues. There are some but they are not overall going to make the performance bad. Pros: I have been waiting for more than 4 months to try their automation and finally today I tried their Beta Testing of Automation with selenium. I just loved the platform. Really they just deliver it and they deliver a great product. Wish you luck with your final release. All the best guys. Cons: There's nothing to complain about. The Platform That One Must Give A Try! A solution we keep coming back. If you need more information about LambdaTest or you simply have a question let us know what you need and we’ll forward your request directly to the vendor.